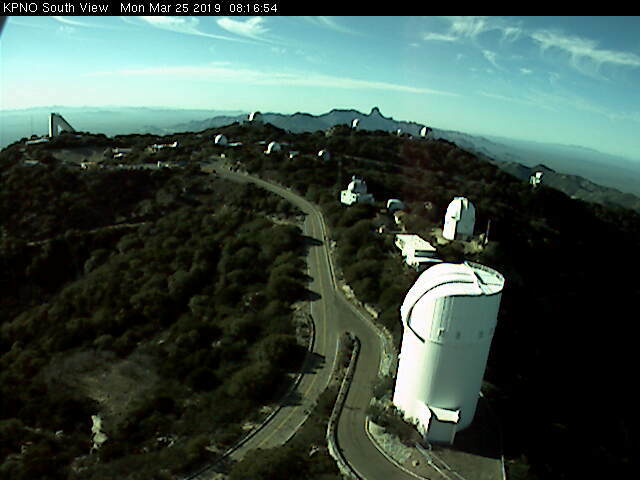 Kitt Peak south webcam this am shows a bit of wispy cirrus. It also looks like March is going to go out like a lamb this year. The am lows here at house last four mornings (Friday to today) were 39, 38, 39, and 39 F versus 42, 42, 47 and ~47 F for the airport. With today's high forecast to be about 85 F, the diurnal swing will be nearly 50 F.
The GEFS plumes from 06 UTC this morning are flatlined for precipitation at airport. Plumes for 10-m T (above) indicate a mild week, with some cooling at end of week. The PW plumes (below) indicate dry and very dry out through April 2nd. Bit of comment on NWS gridpoint temp forecasts. We were at Santa Rita Abbey Friday evening and Saturday. Abbey is about 5 miles north-northwest of Sonoita, along Fish Creek Road at elevation a bit below 5,00 ft MSL. The gridpoint low temperature forecast for that location was for Friday night low of 34 F - but when we arrived a bit after dusk it was already down to 36 F, and I estimate the morning low was somewhere from 21 to 25 F. My experience has been that the grid software consistently forecasts low temperatures, on clear dry nights, that are 10 F, or more, too warm for the area east of the Santa Ritas. Photo below is of Santa Ritas at sunrise, showing that Mount Wrightson is still carrying some snow cover on north slopes.